(May 27, 2015) -- Meet Doug Frantz. The Max and Minnie Tomerlin Voelcker Distinguished Professor in Chemistry was selected by the pharmaceutical company Eli Lilly & Co. to receive its Outstanding Open Innovation Drug Discovery Collaborator Award. For the past five years, Frantz’s graduate and post-doctoral students have developed nearly 1,500 new chemical compounds. Under a collaborative agreement, Eli Lilly has studied the compounds for their potential as medicinal treatments. Two of the UTSA compounds Eli Lilly & Co. is considering could potentially treat schizophrenia and chronic pain. Frantz says that synthetic chemistry is not easy; it requires great patience as students learn the laborious process of trial and error. The students that take on the challenge, he says, make the best scientists across all disciplines. “It’s a frustratingly lengthy process, and 99 times out of 100, the ideas don’t work. But that one time when they get that one reaction to work, the celebrations make it all worth it,” said Frantz. Frantz joined UTSA in 2005 after serving on the faculty at UT Southwestern and as part of the research and development team at Merck and Co. 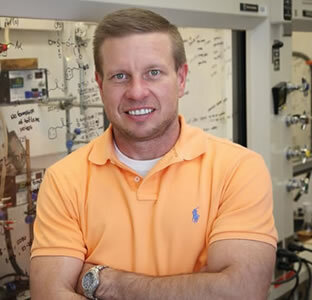 He earned his doctoral degree in organic chemistry from Texas A&M University and his bachelor’s degree in chemistry from Stephen F. Austin State University in Nacogdoches. Do you know someone connected with UTSA who is achieving great things? Email us at social@utsa.edu, and we will consider your submission for an upcoming installment of Meet a Roadrunner.